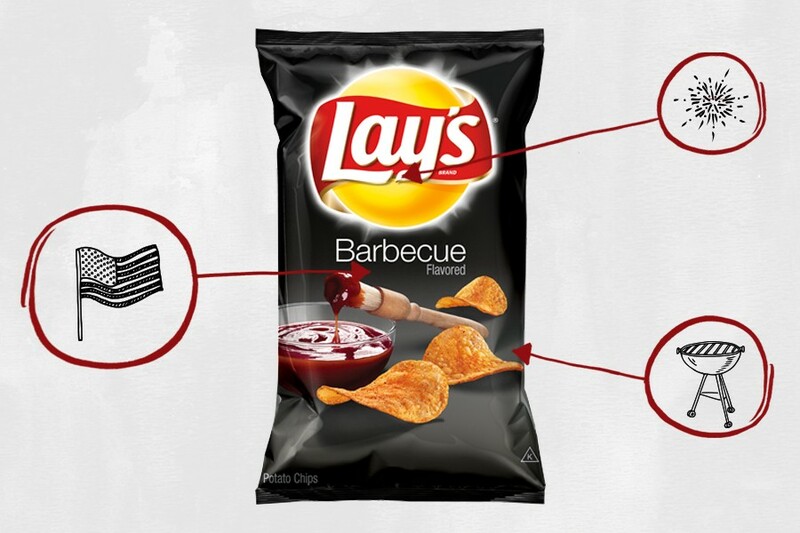 This edition: Lay’s Barbecue Flavored Potato Chips, which are made from 20 separate ingredients that we’ve broken down in the exact order they appear on their website. 1) Potatoes: These are potato chips, after all. 2) Vegetable Oil (Sunflower, Corn and/or Canola Oil): Physician and biochemist Cate Shanahan, author of Deep Nutrition: Why Your Genes Need Traditional Food, previously told us that consuming too much vegetable oil (canola, sunflower or corn) — which is easy to do, considering Shanahan says roughly 45 percent of the average American’s calories come from refined oils — has serious repercussions (i.e., fatty liver disease, insulin resistance and migraines). While it’s nearly impossible to eliminate vegetable oil from your diet altogether — major contributors include processed foods, fried foods, frozen pizzas, cakes, cookies, margarines and coffee creamers — it’s best consumed in moderation. 2) Dextrose: Dextrose is a sugar derived from starches, like corn. Fun fact: Dextrose has a high glycemic index, meaning it quickly raises the blood sugar levels, so it’s used in IV solutions to treat low blood sugar and dehydration. People with diabetes might also consume dextrose tablets to raise their blood sugar levels if they become dangerously low. Because of this blood-sugar-boosting effect, consuming dextrose also provides an almost immediate jolt of energy — followed by an inevitable crash. 3) Salt: Chips wouldn’t be chips without salt, right? 5) Molasses: Molasses is a viscous product made by refining sugarcane (or sugar beets) into sugar. It’s frequently used in barbecue sauce to add a slightly bitter flavor. 6) Torula Yeast: This is a type of yeast that has a smoky and savory flavor. It’s recently become a popular replacement for the flavor enhancer monosodium glutamate (MSG), since it improves the texture and flavor of most foods. Fortunately, it’s healthier than MSG, too (more on that here). 7) Onion Powder: This is an easy one — dehydrated, ground onion used for flavoring. 9) Tomato Powder: Another simple one — dehydrated, ground tomatoes. 10) Paprika: This provides a bit of heat. 11) Natural Flavors (including Natural Smoke Flavor): Natural flavors are flavors derived from an actual food source — i.e., potato flavoring taken from potatoes. In this case, wood is actually burned at high temperatures, and the resulting smoke particles are collected in condensers. That liquid is then concentrated, creating a strong smoky flavor. 12) Corn: Corn can be used as a batter to give fried foods (like these chips) a light and crispy texture. 13) Starch: This is typically used as a thickening agent, and like corn, it’s also used as a batter to give fried foods that light and crispy texture. 14) Caramel Color: As we discovered in our exploration of the eight ingredients that make up Diet Coke, caramel coloring has an incredibly controversial byproduct called 4-methylimidazole (4-MEI): A 2007 study found that mice fed a diet of 4-MEI developed cancerous lung tumors as a result. The FDA quickly pushed back, noting that a human would have to consume more than 1,000 cans of soft drinks (which are notoriously high in caramel coloring) every day for two years to reach comparable levels of 4-MEI. Who’s right is still unclear . More recent studies argue that levels of 4-MEI are, in fact, high enough in soda and consumed in sufficient quantities by Americans to increase the risk of developing cancer. Do you really have to worry about this in the seasoning on your chips, though? Probably not. 15) Yeast Extract: Also known as autolyzed yeast, yeast extract results when yeast is broken down into its individual components, which include the flavor enhancer MSG. Because MSG is a natural component of autolyzed yeast, it doesn’t have to be listed separately on the ingredients lists — so watch out for this ingredient if you’re sensitive to MSG. 16) Paprika Extract: Surprise! More flavor. 17) Garlic Powder: Yep, you guessed it, just dehydrated, ground garlic. 18) Mustard Seed Oil: A fatty vegetable oil resulting from pressing mustard seeds, this ingredient may help protect against heart disease, according to a 2004 study published in the American Journal of Clinical Nutrition. At the end of the day, these chips are fried potatoes drenched in vegetable oil. They ARE NOT healthy, by any means. But occasionally indulging — say, during a summer BBQ — won’t kill you. On a personal note, these are also dangerously addictive. So unless you want to end up eating an entire bag, avoid them at all costs.